KJOoami has been infected with the deadly "Piratesarebetterthenninjas" disease, often resulting in symptoms not unlike constantly speaking like a pirate! Quick! Does somebody have an antidote!?!? Yarr, I don't pay for me copyrighted digital media! 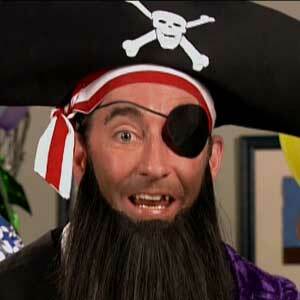 It's talk like I pirate day? Yar, I didn't know that. I'd of been talkin like this all day had I know. Pursuant to United States Code Title 17, Chapter 5, Section 501 and the Housepets! Forum Rules, this thread is closed. Uhhh... It's kind of easy to get in here for being closed. it's too bad this didn't fall on page 50 of this chat. that would've been awesome timing. Yarr, I don't pay got me copyrighted digital media! ...Those bold words gave me a heartattack...Your good Diss! I drive a panda cat. That is all. Racecar. Peanut butter. So, some of my friends and me were talking about an old shirt of mine that everyone loved. It had a picture of Shaggy (From Scooby Doo) and said "slacker" under it. I outgrew it a few years ago, but one of my friends somehow brought up that I looked a little like Shaggy. Then another one joked I should grow my hair out and try to actually look like him. then you have the perfect cosplay for any convention you go to. you just need someone to fursuit as Scooby. ... But I don't go to conventions. I would do it for Halloween, but I don't think my hair is going to grow out enough by then. I'm going to be in the coast guard then. No long hair allowed. use a hair growing shampoo! You know what Brent, I'll do it!! Once I'm out of the service. Shaggy will just have to wait for a few years. Reevaluate your priorities. Shaggy comes before careers! Shaggy can wait...your career is more important, it gives you MONEY!!!!! Hey, just because I dress and talk like him doesn't mean that I'll run away from a ghost like him. It would be awesome to see Shaggy see a ghost and NOT run! Hey, the new i-pod nano is coming out in October, does anyone know the official day of release? I have one pre-ordered, but it just says it will come in October. I looked but didn't see a date anywhere I went, and I would kind of like to know. They still make iPod Nanos? That's some pretty crazy stuff. I've added that website to my favourites, looks like it'd be interesting to check up on every now and then. I'm surprised they're bringing a new Nano out immediately after the iPhone 5, that's expensive enough as it is. I'd say assume it's the 31st and whenever it does come out will be a pleasant surprise. If it gets to the 31st, it's not out and you haven't been informed as to why you're then fully within your rights to nag. Also in reference to Shaggy, get a wig and you can do it this year. Who wants to see some adorable things? My friends and I always have really cool idea for costumes and they wimp out. Why even bother when you can just get an ipod classic? I just cut eye holes into a KFC bucket and wear it as a mask for Halloween. It's a matter of $$. Plus 16 GB is more than I will use before I would get another. Much less the 160 the classic has. I'm not going to use it for videos or anything like that, just strictly listening to music. But I would like a screen, so that's why I'm not getting the shuffle. "Hey guys! Let's put in a hard drive that utilizes moving parts into a very small piece of technology that can easily be dropped, so that way, it breaks! And then let's refuse to replace their product even when it's still under warranty!" - Said the designer of the iPod Classic. Yea, I had a nano before it turned into that small thing that is about to be replaced. I don't know what went wrong with it, but I'm hoping that doesn't happen with this one. If it does, I'm through with Apple. Yuck, sounds like your battery canned. Personally, I love my iPod Touch, but I have an enormous music collection and I was willing to spend the extra money. Also, buy refurbished! This iPod Touch was and I've had it for two years with absolutely no problems, and it saved me like $200. The thing was, I didn't even have it for a year. But I have to admit that I left it in a very dusty place for those 3 or so months, and I think that may have been what did it. We were going to send it back to Apple at one point, but it just never happened. And I would, but the new Nano hasn't come out yet, so it would be kind of hard to find a refurbished one right now. And I don't really want a touch or classic. Or the older Nanos. But I'll think about it when I decide to get another one (hopefully) a few years from now. By then I will have probably bought a lot more music and will be ready for something with more space. Well ipod preference is a weird thing. To each their own.